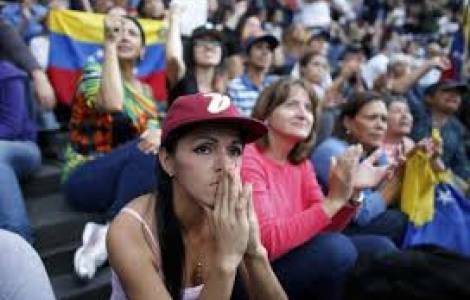 While a very harsh report by Amnesty International on violence, the right to life and public security in Venezuela is being published and as the international community intensifies pressure on President Nicolás Maduro's government, the Church joins the denunciation regarding the abuses perpetrated by the regime against its own citizenship. This time it is Msgr. Pablo Galimberti, Apostolic Administrator of the diocese of Salto (Uruguay) who launches the alarm highlighted by the Venezuelan Bishops during their recent ad Limina Apostolorum visit at the Vatican dicasteries, which ended with a visit with Pope Francis. "To the economic, political and social oppression - writes Msgr. Galimberti in his weekly space in the newspaper "Cambio" - the closure of media is added". He adds:"It is a scandal and a shame that Venezuela has 2,500 blocked web pages today, as well as 372 news sites to which it is impossible to access, among which Colombian channel RCN, the page of the daily El Nacional and the portals La Patilla and El Pitazo". "In the five years of Nicolás Maduro in power - underlined the prelate, 40 independent periodicals have been closed down".